You can't escape this great-looking piece! Signed by artists Frank Nissen and Fred Warter. "Escape from Atens Tomb" is the work of artists Frank Nissen and Fred Warter. The eye-catching creation is an extremely limited edition of only 50 pieces. 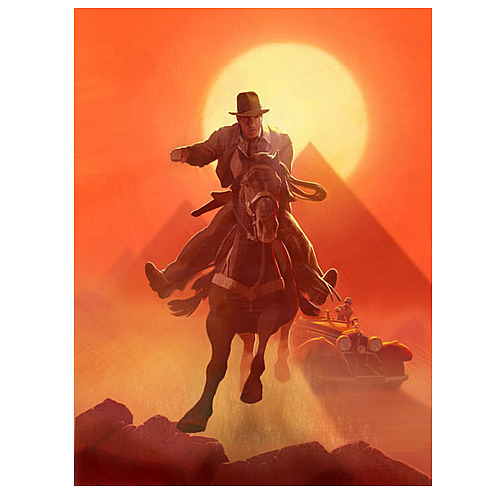 A canvas giclée measuring 24-inches tall x 18-inches wide, this magnificent art features Indy riding off with the pyramids and sunset in the background. It's signed by artists Frank Nissen and Fred Warter, and comes with a certificate of authenticity. Isn't it time you rode off into the sunset with this?